An investment of $49.5 million of federal money will be used to create the next generation of helicopters, Federal Minister of Innovation and Science Navdeep Bains announced in Montreal Monday. Bains made the announcement at an aerospace forum at Palais des Congres, where leaders in the field are gathered over the next two days. The money will go into an aerospace consortium led by Bell Helicopter Textron Canada Ltd.
“Bell and collaborators will develop an advanced fly-by-wire system, which I'm told replaces the pilot’s conventional manual flight controls with an electronic interface, so that sounds awesome and exciting and I'm a bit nervous too, so we'll see how that plays out,” said Bains. The funding is meant to help Bell and 18 partners develop innovative technologies to be integrated into next-generation helicopters, which can fly with or without a crew on board, and fully autonomous aerial systems. “Montreal is very strong in that domain, so we will really work very closely with the people in artificial intelligence because we want to develop applications that will make our industry more competitive,” said Suzanne Benoit, president of Aero Montreal. Bains said the investment will create or maintain hundreds of jobs – and Quebec makes up more than half of Canada's aerospace industry. “We have in Quebec 40,000 jobs. We have revenues of $14.4 billion and we have 220 companies,” said Benoit. Innovation, development and technology are key words at the forum, with artificial intelligence infused in much of what lies ahead in the industry. Air taxis, for example, could be flying sooner than one might think. “The white paper is looking at flying the first prototypes in the mid-2020s, so that's just around the corner in terms of technology years,” said Cynthia Garneau, president of Bell Helicopter. 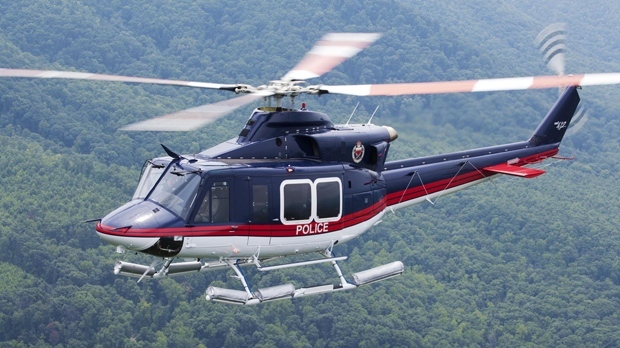 A Bell 412 helicopter flown by Bahrain Police Aviation is seen in a handout image from Bell Helicopter.